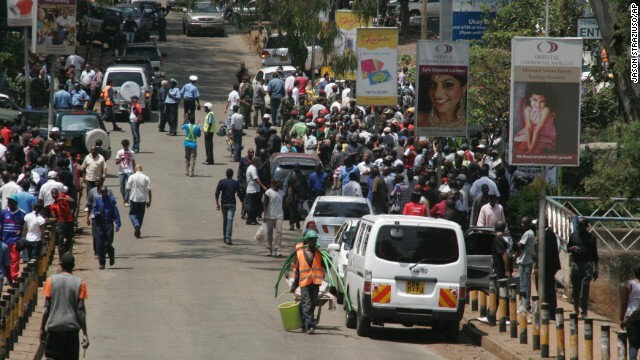 Editor's note: Are you in Nairobi, Kenya? Share your pictures and videos but please, stay safe. 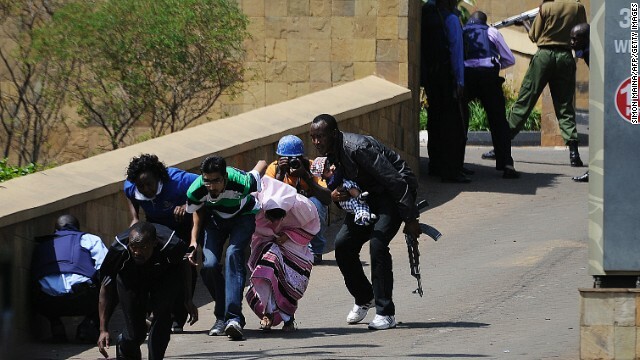 (CNN) -- The weekend massacre at an upscale shopping center in Kenya is shining a new light on an old concern for Western counterterrorism officials: the recruitment of jihadist fighters from Somali communities in the United States, Canada, and Europe. 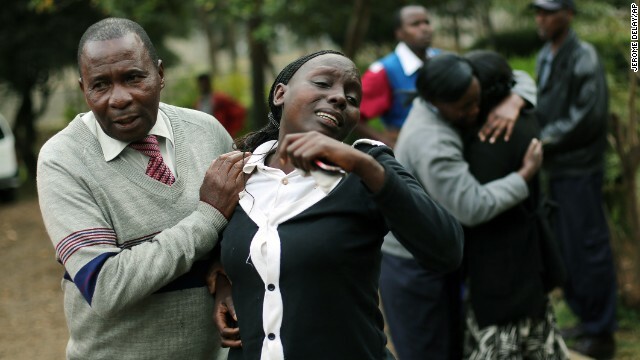 Relatives of Johnny Mutinda Musango, 48, weep after identifying his body at the city morgue in Nairobi, Kenya, on Tuesday, September 24. 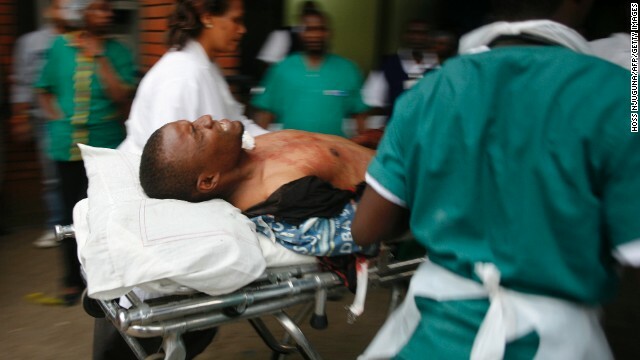 Musango was one of the victims of the Westgate Mall hostage siege. 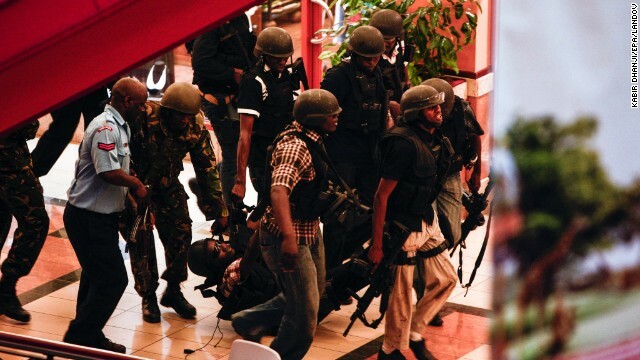 Kenyan security forces were still combing the mall on the fourth day of the siege by al Qaeda-linked terrorists. 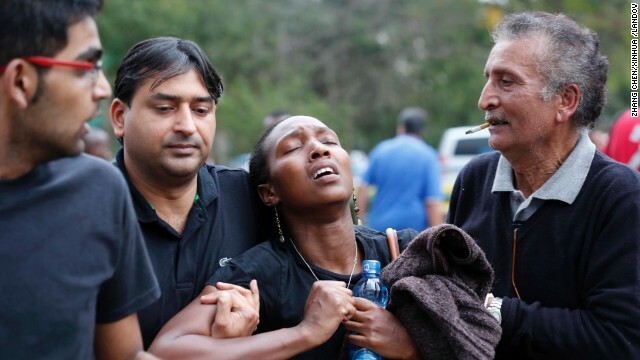 Ann Gakii reacts at the Nairobi City Mortuary after identifying the body of her father, who was killed in the mall attack on Saturday. 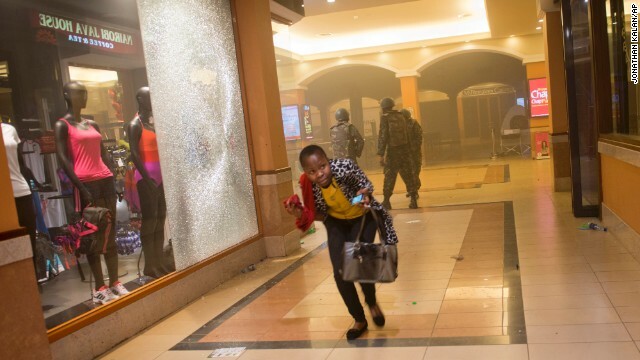 A Kenyan soldier runs through a corridor on an upper floor at the Westgate Shopping Mall in Nairobi, Kenya, on September 24, shortly before an explosion was heard. Sounds of heavy gunfire erupted from the mall Tuesday, even as authorities said they had the building under their control. 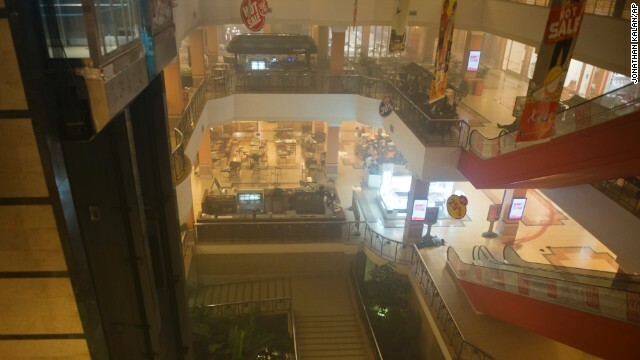 But four days after Al-Shabaab terrorists stormed the swanky mall, several gunmen -- including snipers -- were still inside, two senior officials said. Kenyan Defense Forces walk near the mall on Monday, September 23. 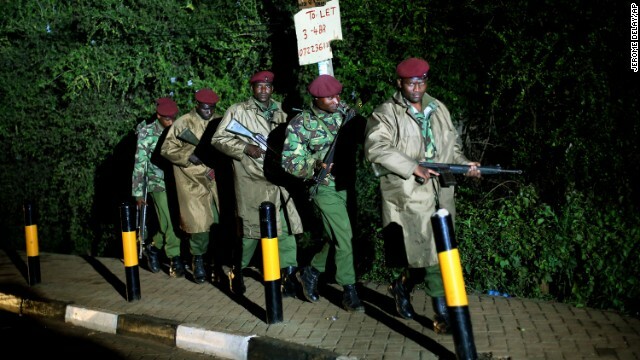 Kenyan Defense Forces leave the mall on September 23. 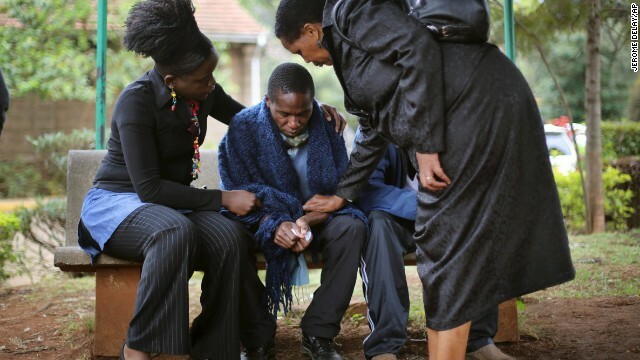 Stephen, center, is comforted by relatives as he waits for the post mortem exam of his father, who was killed in Saturday's attack at the mall. 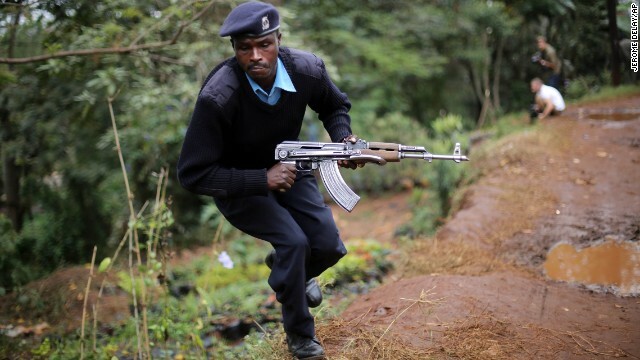 A Kenyan police officer guards the entrance of a building near the mall on September 23. 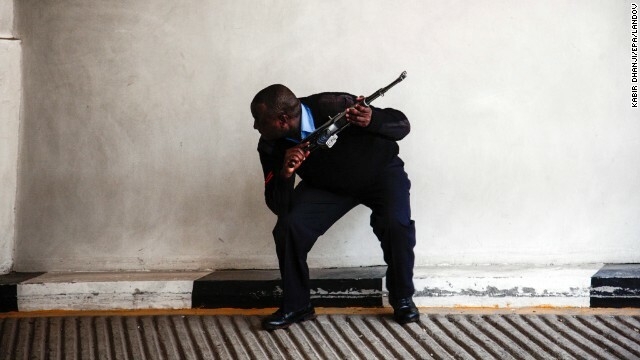 A Kenyan security officer takes cover as gunfire and explosions are heard from the mall on September 23. 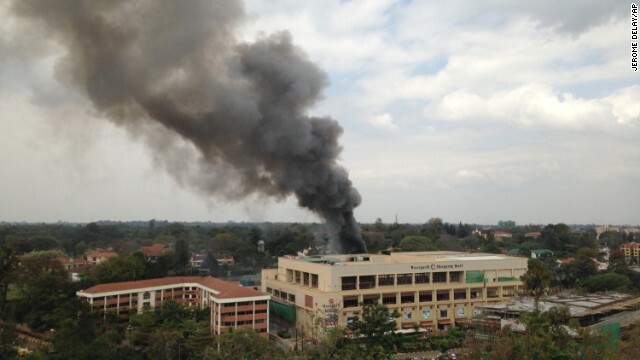 Heavy smoke rises from the Westgate Shopping Mall on September 23. 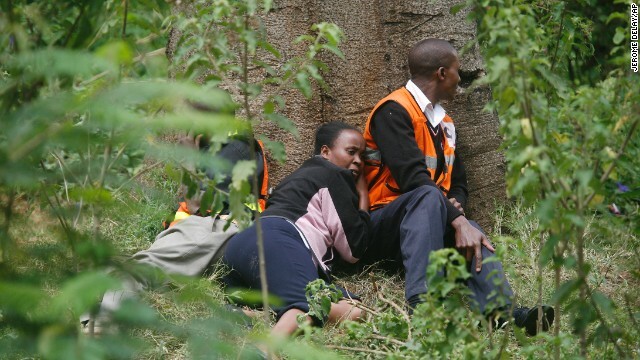 Medics take cover behind a tree as gunfire and explosions are heard from the Westgate Mall on September 23. 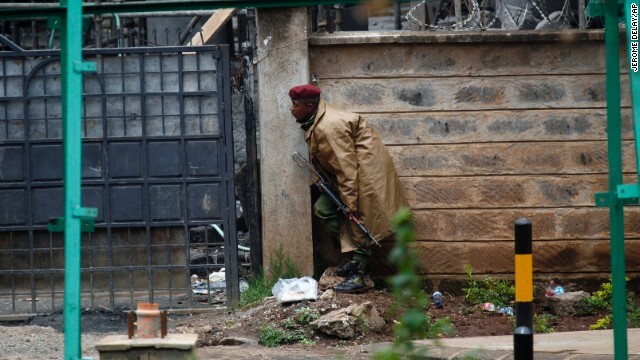 A Kenyan police security officer runs for cover as heavy smoke rises from the mall on September 23. A paramedic runs for cover outside the mall on September 23. 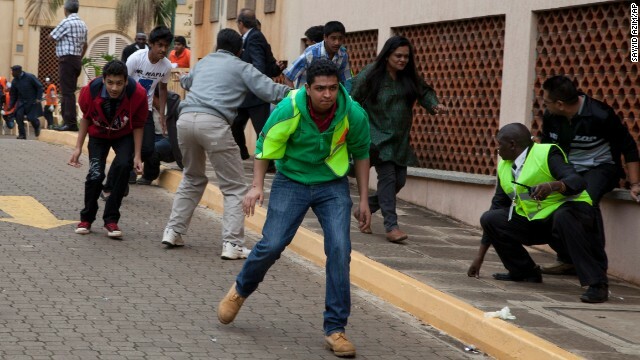 People run for cover outside the mall after heavy shooting started on September 23. 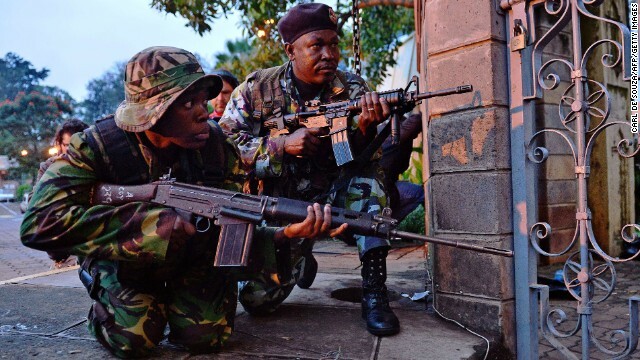 Kenyan security forces crouch behind a wall outside the mall on September 23. Soldiers take cover after gunfire near the mall on September 23. 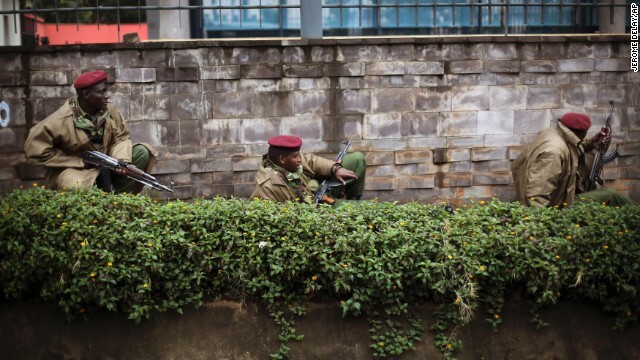 Kenyan paramilitary police officers patrol the area near the mall on Sunday, September 22. 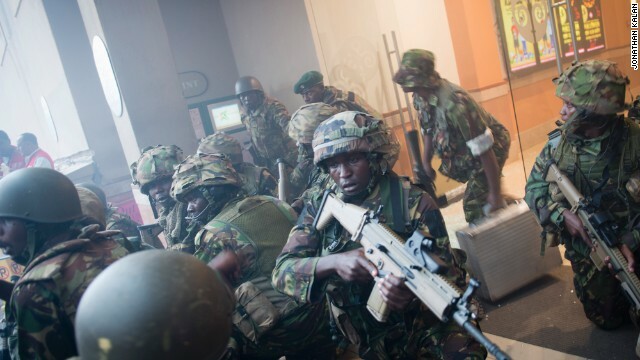 Soldiers from the Kenya Defense Forces arrive outside the Westgate Mall on September 22. 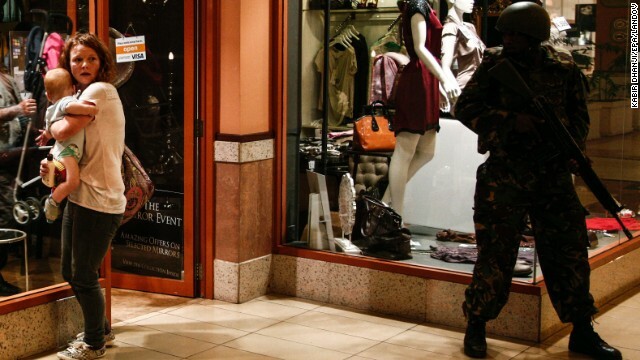 A woman shields a baby as a soldier stands guard inside the Westgate Mall on Saturday, September 21. A rescue worker helps a child outside the mall. 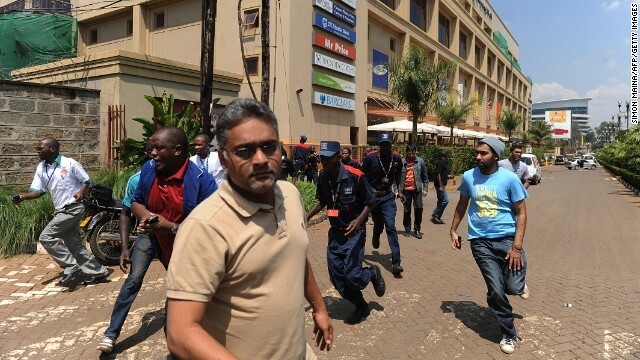 People who had been hiding inside the mall during the gunfire flee the scene. 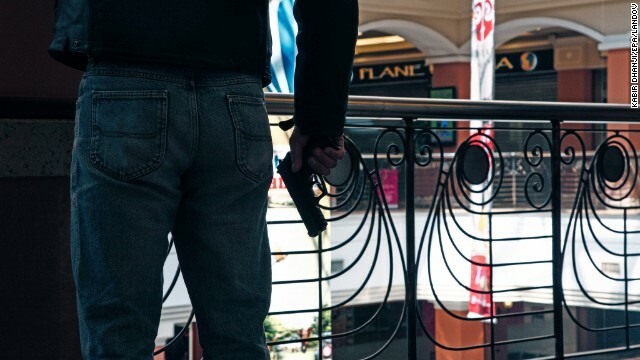 An armed official takes a shooting position inside the mall. An armed official crouches on September 21. 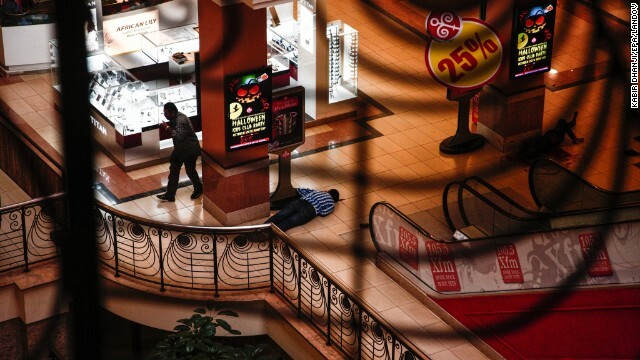 Bodies lie on the ground inside the mall. 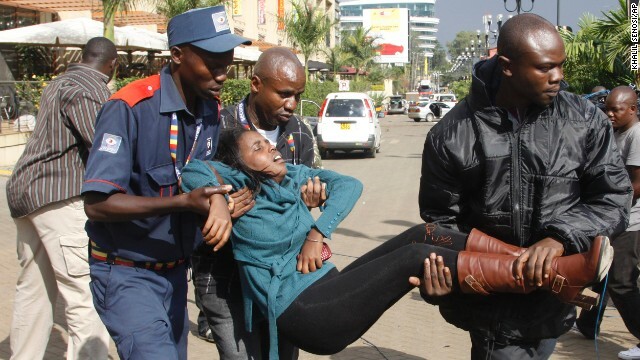 Men help a wounded woman outside the mall. 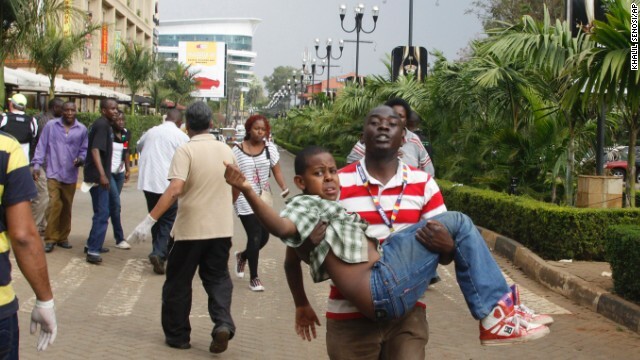 Officials carry an injured man in the mall. 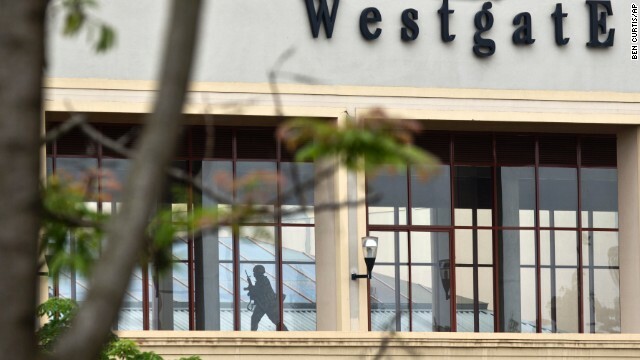 Soldiers move up stairs inside the Westgate Mall. Armed police leave after entering the mall. At least one suspect has been killed, a government official said. 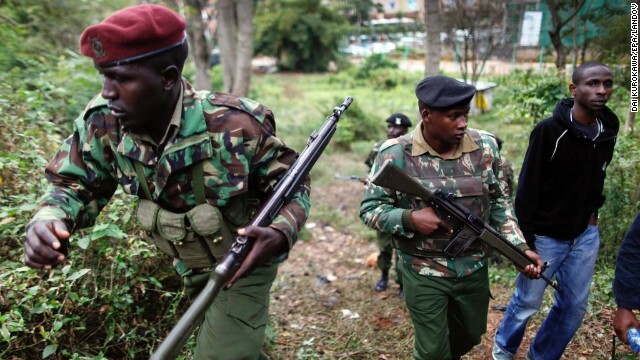 Police have said another suspected gunman has been detained at a Nairobi hospital. Armed police take cover behind escalators as smoke fills the air. Witnesses say tear gas was thrown in the corridors. 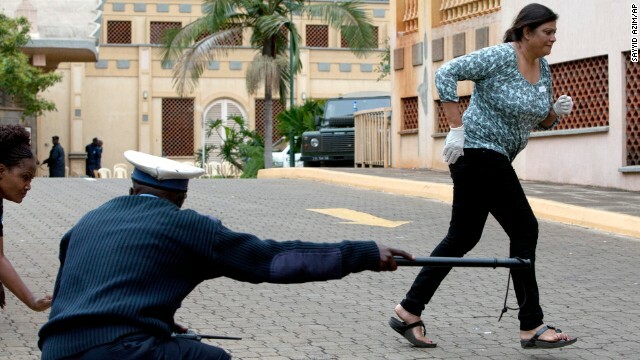 A woman who had been hiding during the attack runs for cover after armed police enter the mall. 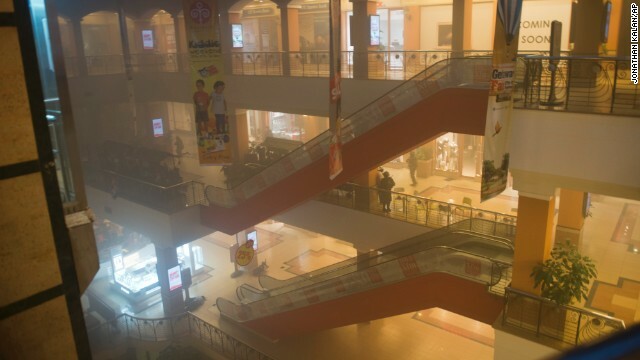 A body is seen on the floor inside the smoke-filled four-story mall. 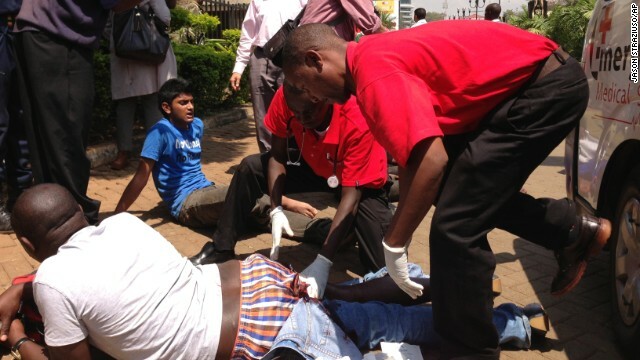 An injured person is helped on arrival at the Aga Khan Hospital in Nairobi after the attack at the upscale mall. A soldier directs people up a stairway inside the Westgate on September 21. 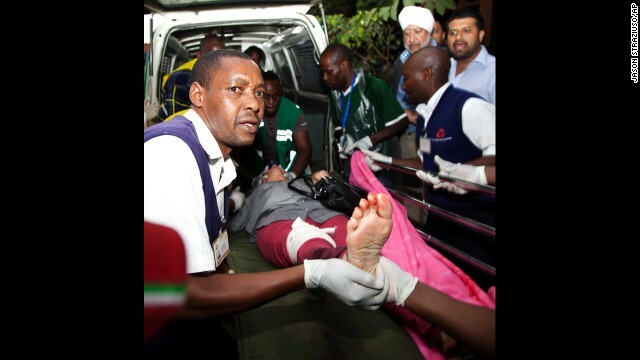 An injured man is wheeled into the Aga Khan Hospital in Nairobi. People run from the Westgate Mall. 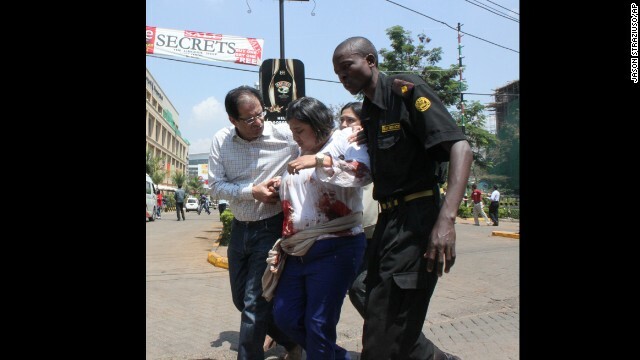 A Kenyan woman is helped to safety after the masked gunmen stormed the upscale mall and sprayed gunfire on shoppers and staff. Crowds gather outside the upscale shopping mall. The interior ministry urges Kenyans to keep off the roads near the mall so police can ensure everyone inside has been evacuated to safety. A policeman carries a baby to safety. Authorities said multiple shooters were at the scene. 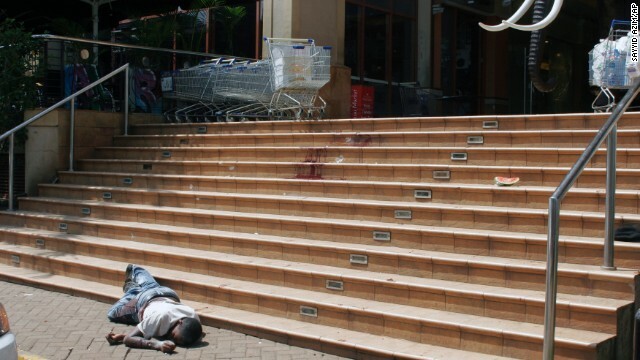 Bodies lie outside the shopping mall. A security officer helps a wounded woman outside. 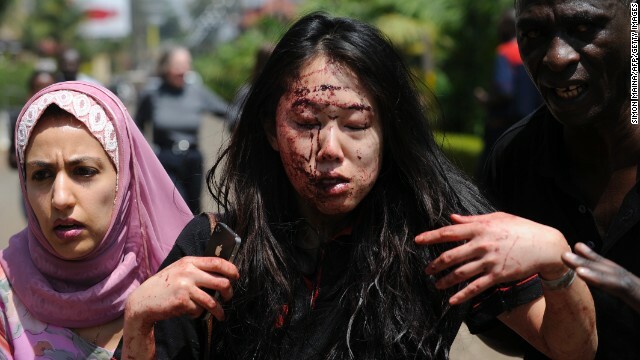 Elaine Dang of San Diego is helped to safety after the attack. The military asked local media not to televise anything live because the gunmen are watching the screens in the mall. Paramedics treat an injured man outside the mall. Medical personnel carry a body away. A woman is pulled by a shopping cart to an ambulance. A wounded man is escorted outside the mall. 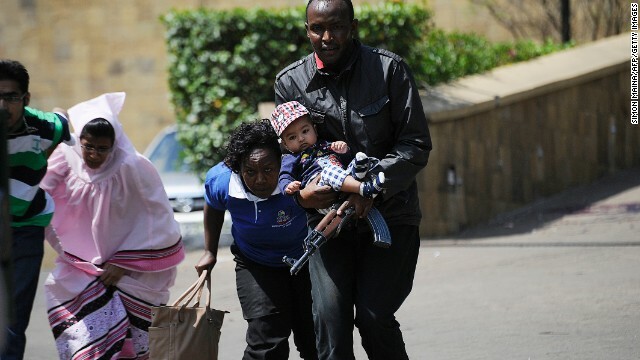 A police officer carries a baby as people keep low and run to safety. Crowds dashed down the streets as soldiers in military fatigues, guns cocked, crawled under cars to get closer to the mall. People run away from the scene. 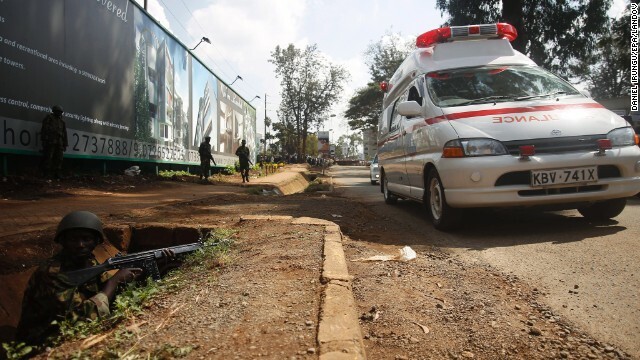 Armed Kenyan forces take position to secure the area around the shopping mall as ambulances move in to carry the injured. 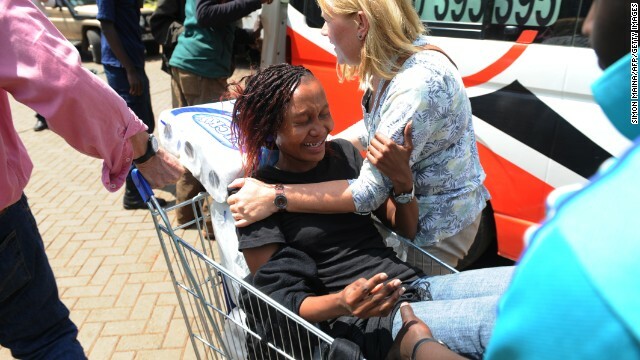 A woman reacts after she is rescued from the mall. A couple flee the area. 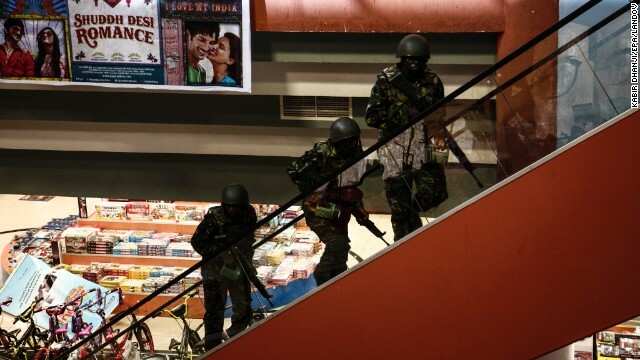 As night fell, authorities said they had cornered the gunmen in the mall. Bergen noted that the group's Twitter page includes tweets in colloquial English, "the kind of English that an American, or perhaps somebody who grew up in the UK, would be using." 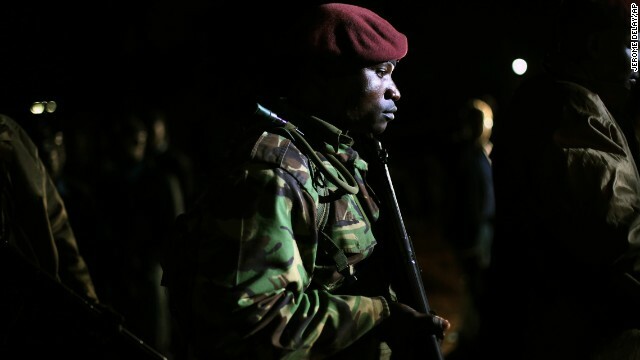 Al-Shabaab is fighting to implement a stricter form of Islamic law in Somalia, a struggle in which Kenyan troops have been directly involved since 2011. Kenyan troops wrested control of the key Somali port of Kismayo from the jihadists in 2012, and Somali government and African Union troops drove the group out of its strongholds in the capital Mogadishu in 2011. As early as 2008, the FBI warned that more than a dozen youths, some of them American citizens, had left Minneapolis, home to the largest Somali population in the United States. At least three are believed to have carried out suicide bombings in Somalia, where an internationally backed interim government has taken tenuous root after two decades of civil war and near-anarchy. Minneapolis' Somali community "is 100% against terror," said Bihi. But he said a lot of families arrive owing "a lot of debt," and community youth programs were "almost nil." Al-Shabaab recruiters engaged teens by providing them entertainment and role models, then "brainwashed" them, he said. 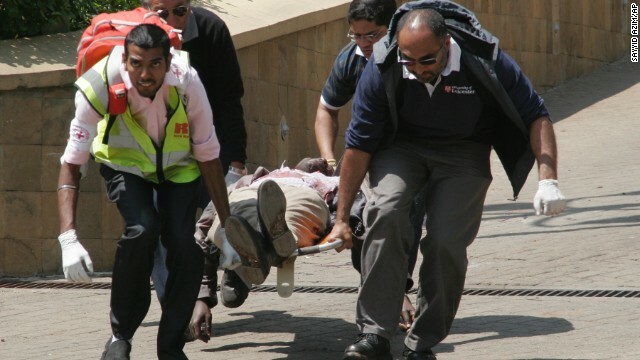 A senior State Department official told CNN that U.S. officials are trying to confirm whether the names released by Al-Shabaab are Americans, but said they are becoming more confident American citizens were involved in the Kenyan attack. The official said the administration has been concerned and raising alarm bells about Al-Shabaab recruitment in the Somali-American community for years and would be making decisions in coming days about additional efforts to stem the flow of recruits. The rest of those named in the indictment had already gone overseas, including Omar Al-Hammami, who became something of a jihadist rock star before falling out with the group and dying in a fratricidal ambush in 2012. As they strolled through the mall, guns strapped to their torsos, the attackers chatted on cell phones while they sprayed bullets at shoppers. A leaked video footage from inside has sparked anger amid claims that it shows soldiers looting from stores as they hunted for the gunmen. Elaine Dang pretended to be dead, and maybe because she did, she is alive to tell her story. She moved away from the crowd because she thought it would be most vulnerable. U.S. Navy SEALs entered the southern Somalia stronghold of Al-Shabaab, the group behind the Kenyan mall attack, in a mission targeting one of its leaders. 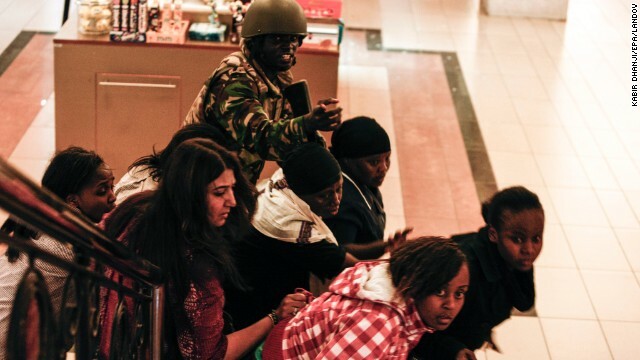 Investigators have determined the attackers or their associates rented and operated a small store in the mall a year before the Kenya mall attack. Propped up by strangers, a woman wails outside Nairobi's main city morgue, unable to control her grief. 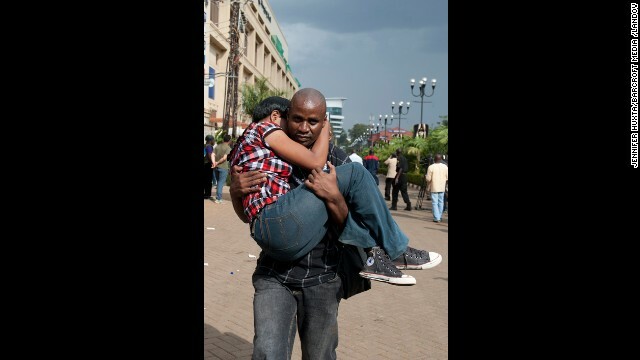 Loved ones mourn the lives lost in the Westgate mall attack. 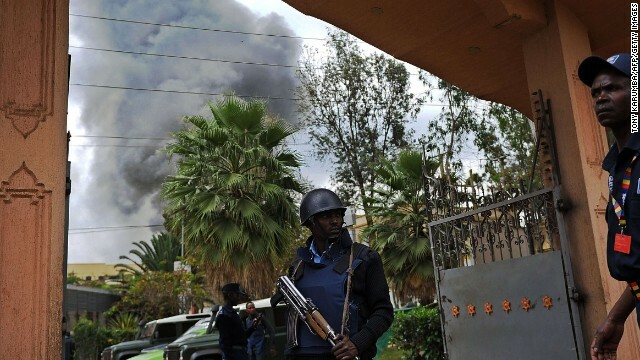 Dozens of civilians and 6 security officers died in the four-day attack. 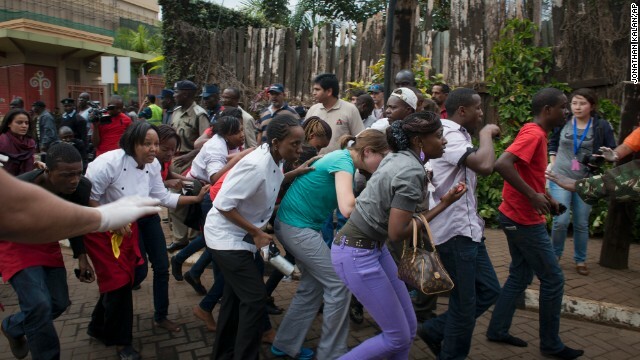 The attack at Westgate mall lasted for four deadly days, with store-to-store siege. Al-Shabaab is shifting focus to 'soft' targets? There is evidence that replicating the 2008 Mumbai, India, attacks has become a major priority for al-Shabaab and al Qaeda. 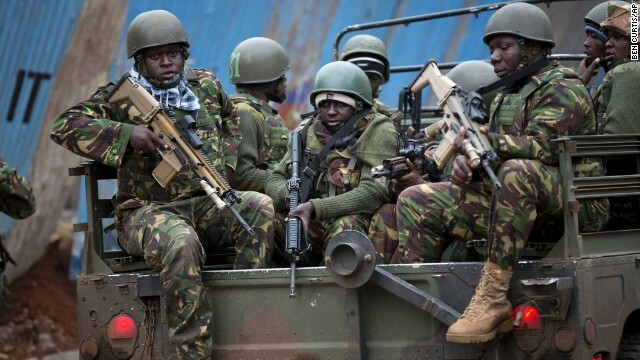 Kenyans debate: Time to get troops out of Somalia? 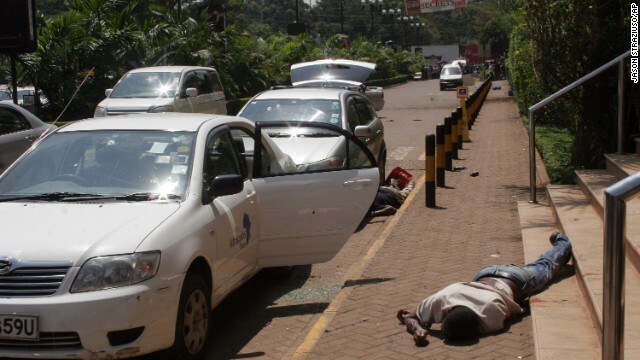 Twenty men are engaged in fiery debate on a sidewalk near Nairobi's Westgate mall, where terrorists stormed the shopping center and killed at least 67 people. Are mass murderers using Twitter as a tool? It was the first major terrorist attack in history in which the group that mounted the operation used Twitter to announce to the world it was responsible. 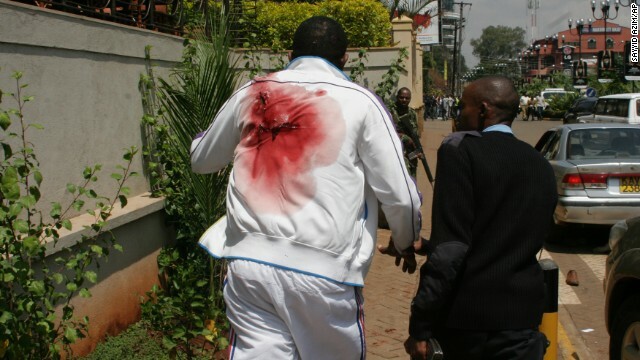 Photos from the attack as it happened. 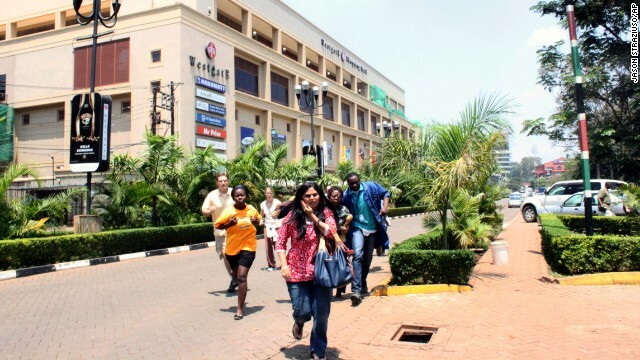 A safe distance from Nairobi's Westgate Mall, several Kenyans stare through a stand of trees at the site of one of the nation's worst terrorist attacks. Was 'White Widow' involved in attack? British-born Samantha Lewthwaite was once seen as a kind of victim of the July 2005 London terror attacks -- the pregnant wife of one of the suicide bombers. 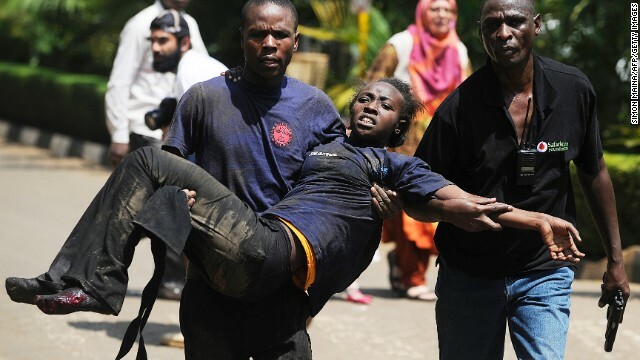 Some answers may be revealed in blood-stained halls or deep in the rubble of Nairobi's Westgate Mall. Others may never be known. The Westgate mall's parking deck collapsed leaving a crater full of destroyed and burned cars in Narobi, Kenya. Of all al Qaeda's affiliated groups, the Somali terrorist organization Al-Shabaab has over the years had the deepest links to the U.S. Mall attack: Could it happen elsewhere? It's hard to imagine a softer target than an enclosed, easy-to-enter space with large numbers of civilians milling about. What the mall looked like before the attack.